Benjamin Moore has been producing quality paint since 1883. In a 2004 poll conducted by House & Garden magazine, the nations top designers picked Benjamin Moore as their number one choice for paints for there clients as well as there own homes. 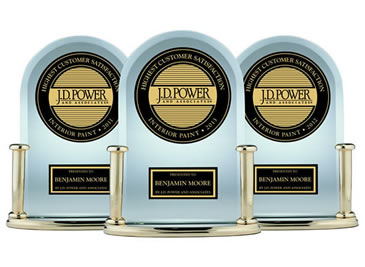 In 2007 Benjamin Moore is proud to have been ranked highest in customer satisfaction by J.D Power and Associates. For over 125 years Benjamin Moore consistently delivers the kind of quality that customers have know & rely on. 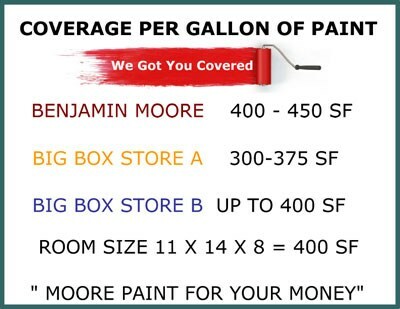 Simply put, Benjamin Moore is your best choice for the highest quality paint and stain available in today's marketplace. Together, Benjamin Moore and The Paint Shoppes are committed to their customers and strive to provide the highest quality products available today. 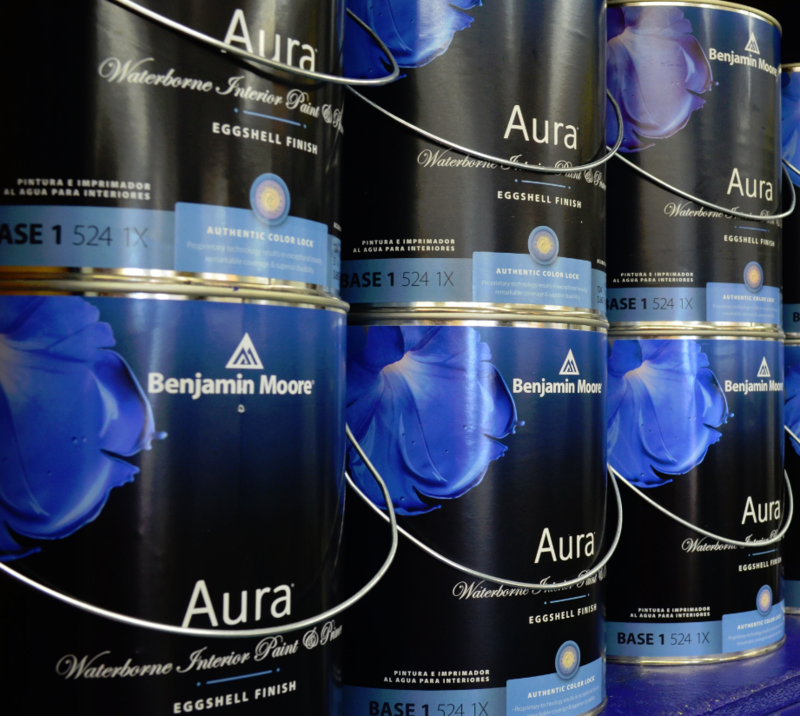 New from Benjamin Moore, Aura is simply the finest paint Benjamin Moore has ever made. Aura offers the most advanced way to bring color to your life with the next generation of paint that simplifies your efforts. Aura paint's innovative formulation allows you the freedom to use any sheen, in any color, anywhere - use a matte finish for the bath or a satin for the bedroom - it's your choice. You'll still enjoy the same superior washability and stain- and mildew resistance qualities regardless of the sheen selection, and with a finish so remarkably smooth you can feel the difference when you touch it. It's waterborne technology means it is low odor and meets the most stringent VOC regulations. Aura covers like no other paint. A single coat provides complete coverage for most colors. In conventional paints, the deeper the hue, the more coats needed for good coverage. With Aura, you'll need no more than two coats for the deepest shades. Drying times are quicker, too; so, if you must, you can recoat one hour after application. Because Aura is so unique, Benjamin Moore developed Affinity Colors, a complementary color palatte to be used expressly with Aura. Affinity colors is a collection of 144 cultivated hues that seamlessly harmonize with one another. Aura paint's technologically advanced system with Affinity Colors' premium pigments to reveal the full nuance and personality of each dimensional hue. Conventional paint systems cannot duplicate the performance of Affinity colors due Benjamin Moore proprietary ColorLock technology, found only in Aura. The cutting-edge color science. 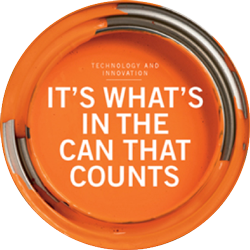 This technology distinguishes Aura from virtually every other paint on the market. Color pigments are microscopically bonded to dry paint film, permanently locking in the color for richer, more enticing hues and a new standard in durability. ColorLock is a four-part system that elevates the preformance of 100% acrylic paint to exciting breakthrough levels. 98% - "No Color Rub Off"
J.D. Power has ranked Benjamin Moore "Highest in Customer Satisfaction with Interior Paints, Three Years in a Row"